It was where the River Blackwater began to widen into the estuary that Maldon's harbour facilities were established at a detached suburb called the Hythe. The word 'Hythe' is an old Saxon word and roughly translated means landing place. The Hythe, Hythe Quay or however you wish to call it, has been in existence for well over a thousand years, and for all of that time, up to and including today, has been the gateway to Maldon for vessels arriving from the sea. By at least 1365 a crane had been set up there to help with the loading and unloading of cargoes, and by 1480 a community warehouse had been built by the town quay. Maldon's obligation to provide a ship for service to the King in time of war also reflects maritime occupations; this obligation is mentioned in Doomsday, in the royal charter of 1171 to the town, and as late as 1336 we find the townsmen being asked to furnish a ship (although they negotiated to pay a sum of money instead). 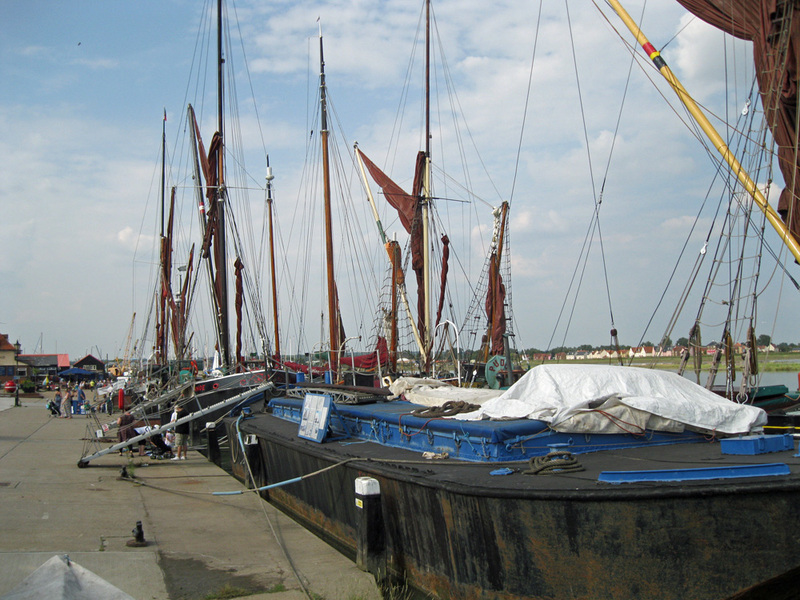 One or two townsmen are revealed as ship owners over the course of the Late Middle Ages, but much of the commerce passing through Maldon's harbour was carried by ships of other towns (e.g. Colchester, Boston) or other countries. One use of Maldon's harbour was for exporting wool, but it may be that sea-coal and dairy foods were among the more important local products. During the last hundred years, the importance of Hythe Quay as a place of trade for cargo carrying vessels has gradually been eroded. Apart from a number of renovated Thames sailing barges, the harbour is used mainly by leisure craft, with the occasional inshore fisherman. The Maldon Harbour Improvement Commissioners can levy dues from shipping to support maintenance of the river. The Commissioners provide and maintain eleven navigation buoys, five of which are lit.